You have a day job to do. You’re happy with outsourcing your 3D printing needs to a bureau. You don’t have the time, knowledge or finances to consider bringing 3D printing in-house or upgrading your existing on-site system. Sometimes we’re all guilty of taking the easy option, of being so set in our ways that change seems like just too much hassle. This December, we are determined to show you that there IS a better way. 3D printing doesn’t have to be expensive, complicated or daunting – all you have to do is let us prove it. SYS Systems is part of the Carfulan Group, which is preparing to host the inaugural Manufacturing Performance Network (MPN) event at its headquarters near Derby. The group’s extensive range of complementary manufacturing technologies is to be brought together in one place for the very first time by its five companies. Among them will be an XJet machine, which employs ground-breaking NanoParticle Jetting™ (NPJ) technology capable of 3D-printing geometrically complex ceramic and metal components quickly, safely and with unmatched quality. 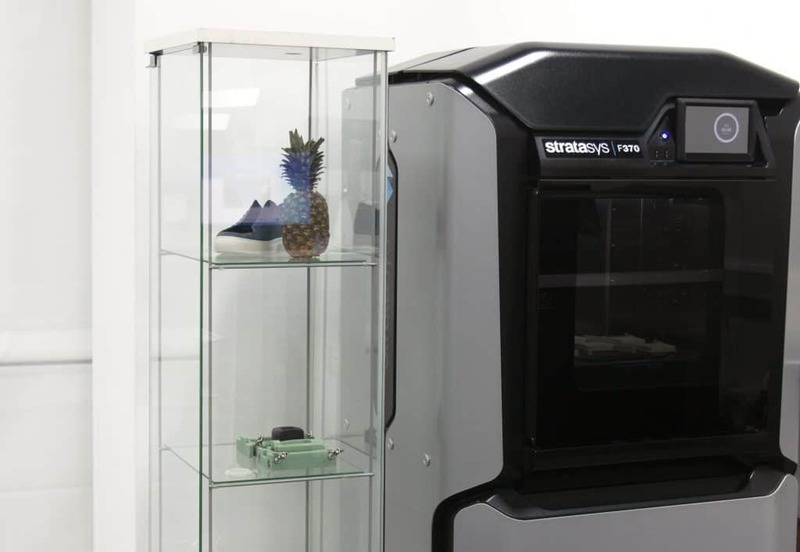 Here at SYS Systems, a UK platinum partner for Stratasys, we have been at the forefront of the 3D-printing movement for more than a decade, supplying, installing and supporting the full Stratasys range. With rapid prototyping capabilities backed up by intelligent software, a vast array of material and colour options and an appreciation for all budgets, bespoke Stratasys systems are facilitating the production of ever-more realistic models and end-use parts. The MPN promises to be a pre-Christmas treat, a completely free-to-attend informal affair where you can drop in and challenge our experts to demonstrate how our innovative solutions could work for you. Live F-Series machine demos of Fused Deposition Modelling (FDM) – FDM sparked the 3D-printing revolution more than 20 years ago and works by building parts layer by layer from the bottom up, by heating and depositing thermoplastic filament. Clean and simple to use, supported production-grade thermoplastics are mechanically and environmentally stable and complex structures are made practical. The F-Series of machines combines FDM technology with intuitive design-to-print software to provide the most versatile and intelligent prototyping solution available. It’s the fastest and most efficient route to get products to market. Experience Nylon 12 Carbon Fiber – this ultra-tough material boasts the highest strength-to-weight ratio around and achieves 30 to 50 per cent higher density on finished parts than any of its rivals. Stratasys systems can print four to five times faster than the competition using carbon fiber, with no compromise on quality. That makes it popular in the aerospace, automotive and sporting goods industries, for example, as well as for tooling and general manufacturing aids. NEW Elastomer – the F-Series of machines just got a whole lot more flexible. With the newest material from Stratasys it’s possible to produce large, complex parts with improved elongation, superior toughness and extreme durability at a fraction of the cost. It will make you rethink what’s possible. Discover the full range of tear-resistant rubber-like materials – hard-wearing, heat-resistant, rigid, flexible, biocompatible and multi-coloured – SYS Systems puts the widest range of materials available in the 3D printing world at your fingertips. That means fast, affordable and super-realistic functional prototyping and agile, ultra-modern production techniques, empowering designers and engineers at every stage of development. GrabCAD software – this intuitive, easy to use and complete solution for Stratasys 3D printers allows for simplified preparing, scheduling, monitoring and reporting of print jobs. GrabCAD can read and understand CAD files natively and, by allowing you to print directly from your favourite professional CAD formats, saves hours of time usually spent converting and fixing STL files. Trade in, trade up / flexible finance options – under SYS Systems’s popular ‘trade in, trade up’ scheme, you can get the full price back against your old 3D printer when upgrading to a new Stratasys model. You can even take up the option of 0% finance over three or five years, meaning there’s never been a more affordable time to access the most up-to-date modelling, software and material technologies available. Alongside SYS Systems, the Carfulan Group is made up of OGP UK, ZOLLER UK, VICIVISION UK and XJ3D. Its unique business model allows it to work with leading UK manufacturers in multi-sensor metrology, turned-part measurement, additive manufacturing and tool presetting and inspection, unleashing their potential for improved business processes and end-product excellence. Best-in-class technology from across the companies will be on show throughout the MPN, while experienced engineers will be on hand to chat to visitors about how they can improve their production performance and ultimately save time and money.